I pay attention to the spiritual teachers that inspire me and challenge me to think about my journey and my work in a new way, such as: Elizabeth Gilbert, Rob Bell, Elizabeth Lesser, Marianne Williamson, Byron Katie & Esther Hicks. I have become that person that is consistently in the middle of several books at the same time. I listen to inspirational talk radio in the car; I listen to audio courses while getting ready in the morning; I meditate and I am completely addicted to yoga. I sometimes have to cut myself off from the constant stream of soul-feeding in order to allow it all to just…sink…in. 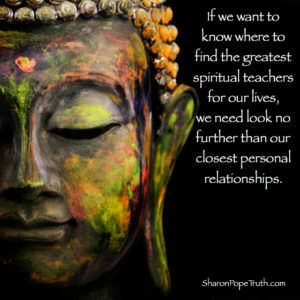 But if we want to know where to find the greatest spiritual teachers for our lives, we need look no further than our closest personal relationships. Unlike traditional teachers who are there to impart wisdom, our closest relationships are there to expose all the parts of us that we don’t really want to own, to teach us about forgiveness and acceptance, to bring to light our beliefs about our ability to love and be loved. My relationship with my Father taught me that whatever judgments I have about someone else are really just parts of me that I don’t like very much and want to keep hidden. My relationship with my best friend taught me that there are people that you are connected to at a soul level. She also taught me that it is only once you can love, accept and forgive yourself that you’re able to love, accept and forgive everyone else. My relationship with men that I have loved taught me that love is risky and messy, but it’s worth it. My relationship with my brother has taught me that we’re all just doing the best we can with where we’re each at on our own respective journeys; and that’s always enough. My relationship with my husband has taught me that it is only through great honesty, trust and vulnerability that you will find great intimacy, passion and love. 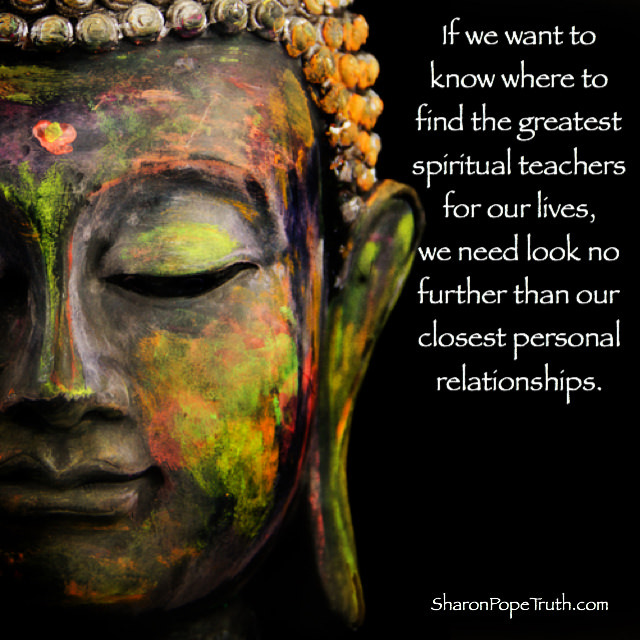 Every person in our lives is there for us as both our greatest spiritual challenge and our greatest spiritual teachers; they’re a divine gift to open us up to the deeper truths of who we really are and to challenge us to become our highest and best version of our selves. So, if you find yourself getting frustrated with those closest to you over the holidays, go looking for what they are there to teach you…about yourself. Look for what’s true. Look for the real gift this holiday.